Shred the cabbage and apple. Assemble into a large bowl. Mix the cranberries and salt with cabbage and apples. Seal the container and let it sit on your kitchen counter, out of direct sunlight, for 6 days. After 6 days, place the kraut in the refrigerator. While on the counter, check the vegetables every day to make sure they are fully submerged in the water. If they have risen above the water, simply push them down so they are fully covered by the water. If any white spots formed because the veggies rose above the water, do not worry. Remember, this isn’t harmful. Just scoop out the vegetables that have the white spots on them and push the rest back under the water.Storage note: This kraut can be kept in a covered airtight jar in the refrigerator for up to nine months. Storage note: This kraut can be kept in an airtight covered jar in the refrigerator for up to nine months. 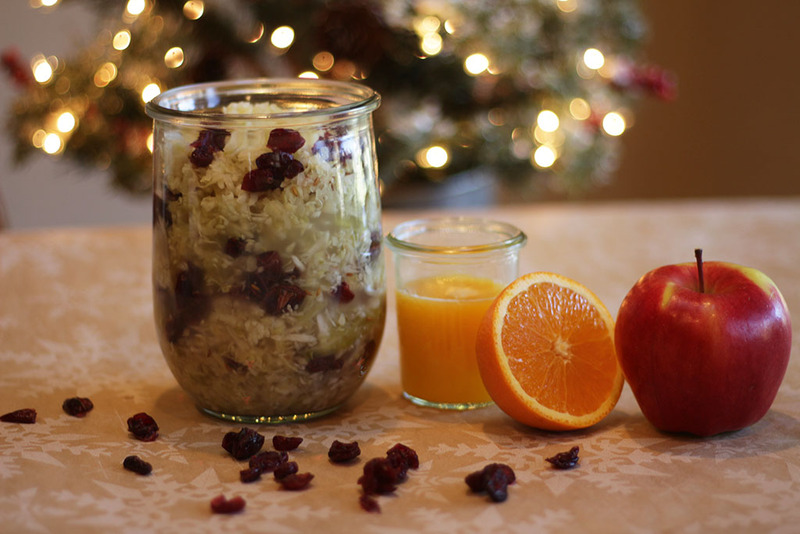 10 Responses to "Christmas Kraut"
Hi Donna- We love this recipe ! Just a quick question: your recipe calls for an entire packet of starter culture for 1 quart of veggies. Do I need the WHOLE bag ? Thanks so much for your time. No you only need a quarter of the package and I will correct in on the recipe, thanks! Wish I would have seen this recipe earlier!! Looks yummy! My question is the packet of cultures says is good for about 4 lbs of veggies. Can you use a partial package or once its opened do you have to use it right away??? Thank you!! You can just use a partial part of the package but store the rest in the fridge. Thank you for sharing so much on your site! I added kale to the Christmas Kraut and am wondering if it should still be 6 days on the countertop. It looks beautiful and we are looking forward to tasting the finished product. Whisking you a peaceful Thanksgiving! Thank you for all you do and your generosity! I just made a batch of Christmas Kraut but added chopped kale. Is 6 days still the amount of time I should keep it on the countertop? It looks lovely and I am looking forward to trying it! Yes, it is and taste it and if its tart or sour its done. You can try it although I never have. They might get mushy.